If you want to win league battles in Pokemon Magikarp Jump then you have to know how to earn coins fast. Coins are necessary for things such as upgrading food and training items, which help level up your Magikarp and their ability to jump. With all that in mind, use these 3 easy techniques to become the ultimate Pokemon Master by providing your Magikarps with all the love, care, and attention they need to be the very best! The first way to earn coins fast in Pokemon Magikarp Jump is by heading to Town, tapping on the Diamond Shop, and checking out the Decorations. Here you will find a variety of cutesy decor for your Magikarp’s pond. These decorations have effects that include boosting the number of coins you get from completing tasks. 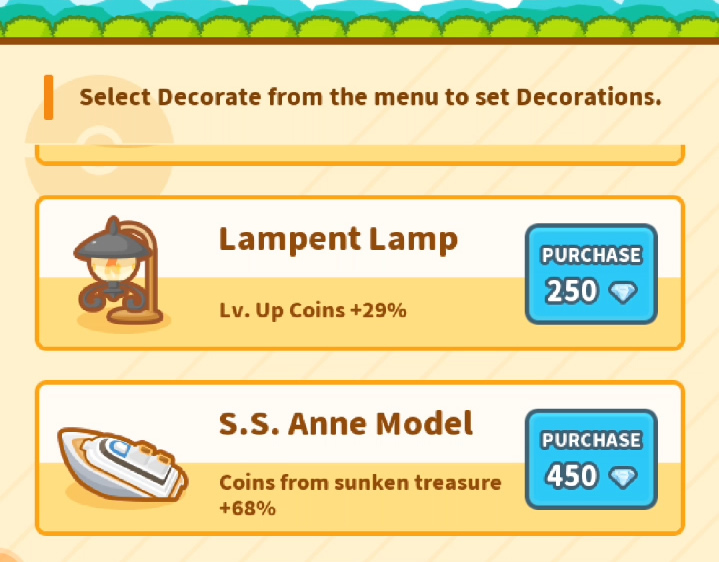 Some helpful decorations to invest in during the early stages are the Sunflora Bunch, Exeggutor Palm, Lampent Lamp, and S.S. Anne Model. 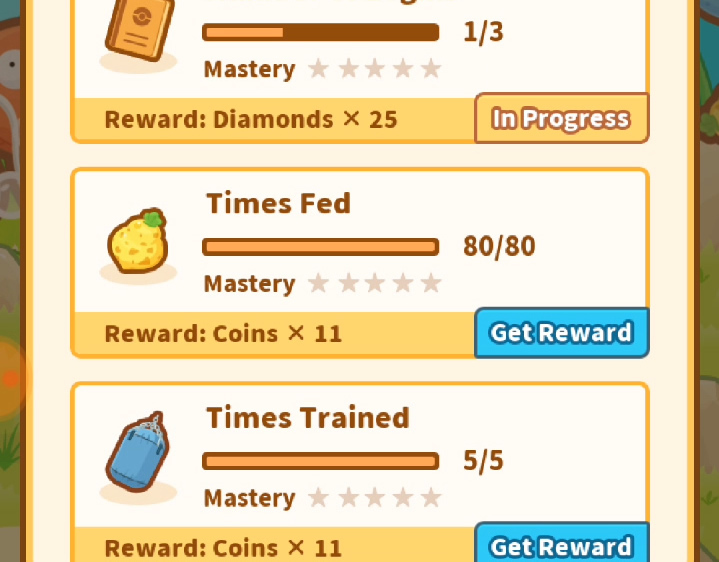 The next way you can get some extra coins fast is to start completing achievements. If you look at the upper right-hand corner of the screen while at your pond, you should see a Menu button. Tap on this and it will display some options. Open up the Achievements screen and you’ll find a list of achievements that are in progress. Each time to complete an achievement, you can claim a reward of Diamonds, Coins, or Support Candy. 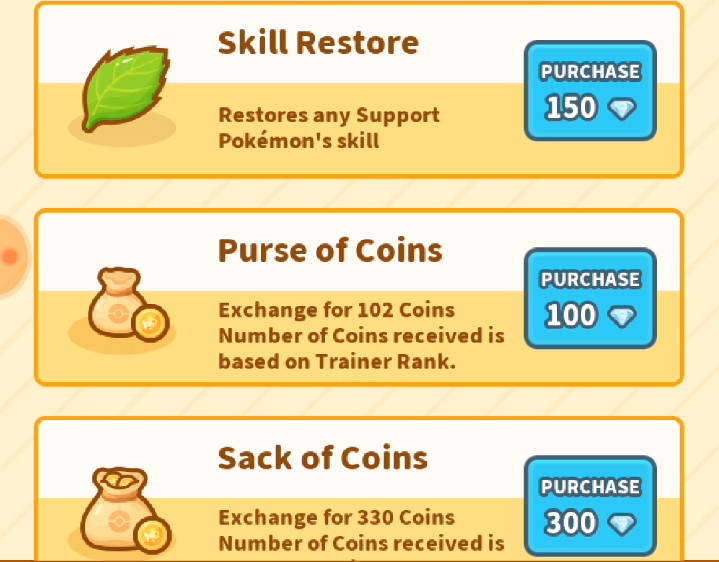 If you find yourself with a surplus of Diamonds in Pokemon Magikarp Jump, you can exchange them for some extra coins. Take a trip into Town, head to the Diamond Shop, tap on Items and scroll down until you see Purse of Coins, Sack of Coins, and Mountain of Coins. Each of these items requires a certain amount of Diamonds to purchase. The amount of coins you receive in return is based on your Trainer Rank. The higher your trainer rank, the more coins you’ll get for exchanging Diamonds for Coins. With these 3 easy methods, you should be able to earn coins fast and give your Magikarps the best pond they’ve ever seen. Make sure you check out our guide on how to level up fast in Pokemon Magikarp Jump.